Eason Chan attended the launch of his twelfth Mandarin album《Rice & Shine》on 13 July 2014 in Taipei, Taiwan. No, that was not a typo but a deliberate play on the title by the Hong Kong artiste. The new album is divided into two parts, with 'Rice' written by alternative group 'Radio On Mars 火星電台', while Singaporean singer / songwriter JJ Lin Junjie 林俊傑 worked on 'Shine'. The latter also attended the album launch, and was pictured in a Comme des Garçons SHIRT patchwork t-shirt. Interesting that both Eason and JJ opted for very casual looks for the album launch. The Asian music market is a place where usually no expense is spared for promotional launches, where artistes are usually decked out in elaborate costumes and outfits straight off the runways. Perhaps it is a testament to Eason and JJ, both considered to be very talented artistes who do not require fanciful gimmicks. Now, what's with the shower head? 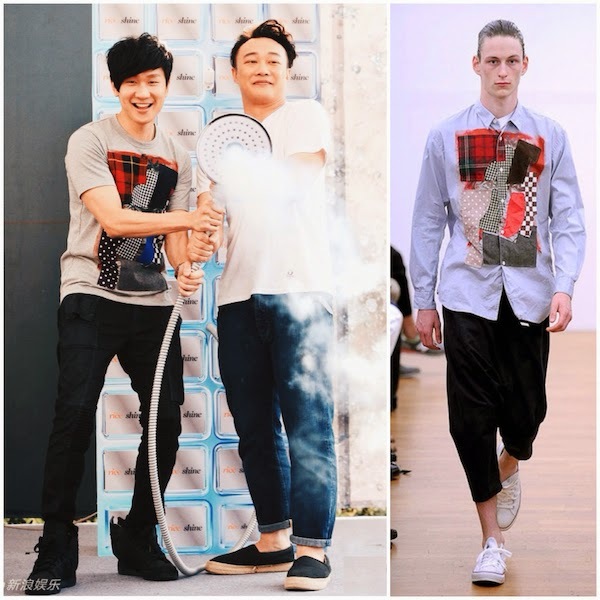 I love JJ Lin Junjie's patchwork t-shirt from Comme des Garçons SHIRT. However on closer inspection, the patchwork included a pair of sinister looking eyes peering through. Fornasetti-like, or just plain scary?